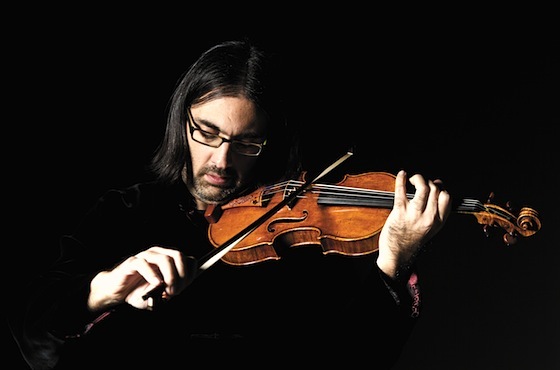 December 5, 2013, 11:03 AM · How is it that Greek violinist Leonidas Kavakos has such impeccable sound, articulation and musicality, and can still keep a kind of raw human quality in his playing? His musical phrases have the motion of an arrow soaring on its own momentum. No technical feat, however difficult, seems to keep it from hitting its mark every time. Leonidas, now 46, won the Sibelius Competition in 1985; then first prize in both the Paganini and Naumburg competitions, in 1988. Over the last 23 years he has steadily built a stunning discography and a solid reputation as a thoughtful musician as well as a violinist with virtuoso technique. Some of the highlights of his recording career: in 1992, he made the first-ever recording of the original version of the Sibelius concerto. He has also recorded the 24 Paganini Caprices, the Six Sonatas by Ysaÿe; all five Mozart Concertos and in January of this year, the Beethoven Violin Sonatas with Enrico Pace. His newest recording includes the Brahms Violin Concerto, with Riccardo Chailly and the Gewandhaus Orchestra, and also the Brahms Hungarian Dances and Bartok's "Rhapsodies," with pianist Peter Nagy. In the new recording, Kavakos gives a breathtaking performance of the Brahms Concerto, clear and streamlined, with no murkiness in the Romantic texture. The recording also includes Bartók's "Rhapsodies" and Brahms "Hungarian Dances," with pianist Peter Nagy. Leonidas currently plays the ‘Abergavenny’ Stradivarius of 1724, and this November, he was awarded an honorary degree from the New England Conservatory. His teachers included Stelios Kafantaris, Josef Gingold and Ferenc Rados. We spoke over the phone while he was in Boston to conduct the Boston Symphony in a performance of Mozart Violin Concerto 4; Prokofiev Classical Symphony and Schumann Symphony No. 2. We talked about his family's connection with folk music, about Brahms' connection to the Gewandhaus Orchestra, about Josef Gingold and the ethics of teaching music and more. Laurie: How did you get started, playing the violin? Leonidas: I was born in Greece, in Athens, and my family was a musical family. My father was a violinist and my mother played the piano; that's how they actually met. My grandfather from my father's side played the violin, but he played folk music, mainly. I had the music all over the place there because folk bands were practicing, so I was listening to them. So music was in my life since I was born, more or less. Leonidas: Before, that's actually right! Laurie: I really enjoyed the Bartók Rhapsodies on this new recording, and I wondered if all that folk music in your background influenced how you approached them. Leonidas: The greatest thing about folk music is actually the process of playing: when you actually get to see how these musicians function. My father started with folk music, and the way the lessons worked was that the teachers would play the tune and you had to pick it up and play it yourself. It's a very literal kind of training (compared to) the training we have as classical musicians, where there is a method, there are steps, and slowly you learn how to read music, then you stand in front of a text which you are learning, and so on. The whole mentality, the whole approach to playing, is totally different when you are a folk musician. Everything is much more instinctive, everything is much more improvisatory, more spontaneous. And (folk musicians) don't play 'concerts,' they play gigs where they have to keep the pace. It's like a good deejay today, only with live music instead of recordings: You have to play in such a way that the people are in a great mood the whole time -- ready to dance and ready to celebrate -- so that the good spirit doesn't get lost somewhere. This approach is a fantastic one which, for us in classical music, is something that we can appreciate and learn from. The great thing about Bartók is that, even though he was such a talented and wonderfully gifted and skilled composer himself, he had the vision to understand how valuable the sources of the tunes are. Then he had the patience to travel and to collect them in a systematic way, in order to be able, later on, to embody what he collected, into the music that he wrote. His music is so fantastic because the folk music is at the center, it always has a human life to it. Therefore what comes out of that human life are the experiences -- personal experiences or the collective experiences, because sometimes you have folk music that characterizes a country or religion or a tribe. Then all this folk music that is very unique, personal and pronounced, becomes part of Bartók's music. A few years ago I did a concert where I invited a folk band from Hungary, whose leader Andras Janosi, teaches folk music history. He brought his band, and they played the tunes that Bartok had collected, which are the tunes that one hears in the Rhapsodies. We did it in such a way that they would play the tunes and then after a certain number of bars, I would start with the piano, playing what Bartók wrote, so the audience could actually see the transformation of a simple folk tune into what we think of as Bartók's world. It was quite an experience, both for the audience but especially for us, I think it was fantastic. Also for the folk musicians because they played their tune, probably in the way that Bartók heard it, but then they also had the chance, right next to them, to see what actually he did with this tune, because it's exactly unchanged, the same tunes. Laurie: Did it change, for you, the way you were approaching those pieces by Bartók? How do you capture that folk spirit? Leonidas: Oh yes. One needs to be informed about how these musicians play in that part of Europe, and there is a certain way of articulating, even the melodies. It's nothing to do with the way we learn to play melodies in the classical world. The main and the most important element of the music is the rhetoric, the rhythmic rhetoric. There must be a rhetoric. That means that even in the melody, that there is some kind of rhythm that is under it, which suggests certain a certain kind of swing. For instance, if you have a singer, then you have the words, then the rhetoric, in a way, is there and the words are dominating how you're going to sing and how you're going to present the musical text. But when you have no words, if you just play instrumental music, then the rhetoric is created by the articulation of the swings that lie inside the music, whether it's a melody, or whether it is something that is very strong rhythmically, which of course, is easier because it's more obvious. It's important to see, as a player, how folks musicians play, how they articulate. I think this is also what Haydn heard. Haydn was one of the first people who brought the popular music into the palaces, and we should really acknowledge that folk dances were the first form of revolution against the monarchs of the time. Laurie: The Brahms Hungarian Folk Dances are also on the recording, also folk music. Leonidas: And the Brahms Violin Concerto itself includes this idea of the folk music, even in the first movement. It is everywhere, and you have many times this very strong atmosphere, for instance in the second entrance of the violin, after, there's the introduction, the first big entrance of the violin, and then there is the next big tutti and then the second entrance of the violin, this is as Hungarian, almost gypsy, as it can be. And this is in the first movement. In the third movement, of course, it's extremely obvious that this is a Hungarian Dance. This is also the reason that I included the Hungarian Dances by Brahms. Those were originally composed for four hands, but this version is a transcription made by Joachim. That also strengthens the link of Joachim and Brahms. Of course, without Joachim, Brahms would not have completed this concerto. For me, the message behind all this is that folk music focuses on human life, which is something that, in our time, is needed more than ever before. Laurie: And why is that? Leonidas: That's because the world is looking more and more at people as numbers, as financial figures that serve or don't serve certain financial functions, economies and so on. We are getting away from the respect of human life, from seeing human life as the greatest gift that one can receive. Folk music never forgets that, because it just comes from that. I would say it's human life distilled through music. Laurie: Another thing about Brahms is the composer's link to the Gewandhaus Orchestra, which premiered so many of his works. Is that something you felt, when playing Brahms with this orchestra? Leonidas: On the day of the first performance with the Gewandhaus, a colleague from the orchestra brought me a photocopy, from the orchestra's archives, of the original program of the very first performance of the Brahms Concerto. It is written in the program, 'New Manuscript, conducted by Johannes Brahms, violin concerto, played by Joseph Joachim.' Imagine! Of course it does have special value, of course it does. How could it not? Laurie: Musically, do you feel they carry a unique tradition forward? Leonidas: Yes, absolutely. This is an orchestra, together with Dresden, that until very recently was isolated in the former East Germany. It was very closed, very limited -- not accessible at all. Today, most of the great orchestras are very international, in terms of where the members come from. This was a situation where the members were almost exclusively coming from that area of Germany. Before they played in the orchestra, they were trained in the Academy of the orchestra, by the previous members. You couldn't just enter because you played well, you had to be trained to play in the way the orchestra was playing. That helped these orchestras preserve, even up until today, a very personal sound and a very personal way and approach to the music. The overall sound of the orchestra and the overall approach to music, the overall concept, identity of sound, is there, and it's a fantastic contribution to start with. Laurie: And you also toured with them, doing the Brahms Double, as well? Leonidas: I just did. Last week we finished the tour, it was a tour where all the Brahms symphonies and concertos were performed, and I did the Double Concerto and the Violin Concerto. Laurie: This has been a lot of Brahms, then. Leonidas: Tell me about it, and do you know what's coming up? The Brahms Sonatas, with Yuja Wang, which we are starting next week! Laurie: What is this doing for your brain, to be on this much Brahms? Leonidas: It doesn't disturb, let me put it this way! It's just inspiring. It's like being together with a great person: there are only things you can gain. These scores are such sources of wisdom and fantastic energy. The longer one works with them, the deeper one digs into the spirit that lies behind the notes, the better one becomes. Laurie: Do you have a favorite, of the Sonatas, or is that like asking if you have a favorite child? Leonidas: Yes, it is. I can't answer that question, sorry. Laurie: I think a lot of violinists would be hard-pressed to answer that one! I wanted to ask you about something else; I understand you studied with Josef Gingold, at Indiana University, which is actually also where I went to school. What is the most important thing you learned from him? Leonidas: At that time when Gingold was there, (Indiana University) was certainly an inspiring place to be, as you know, and Gingold was great in many different ways. First of all, the most important element which I received from him was his absolute passion and love for the violin and for the music. Even at that late age, he was totally committed, devoted, and always fresh about everything. That is not only because of him, but that is the great thing about music and the arts. Still, when one has this as a profession, it's totally different. Many times we fall into a kind of wrong cycle of routine. But there was nothing like that with Gingold. I was 19 when I went to Gingold, and I think there is nothing more inspiring for a young person, than to see somebody who is quite old, who is still so inspired, and still somehow fresh and young in his spirit for the music. Of course, the man knew exactly what he was talking about; he knew violin so well. He was a student of Ysaÿe -- studying with Gingold, one felt like a practically a grandson of Ysaÿe. If you look at it from a certain angle, you can really argue that this could be the case! And the delicacy of the Franco-Belgian school of playing the violin was very apparent in his approach to music. The way I arrived in Bloomington was quite unexpected for me (through an Onassis Foundation grant), but once I was there, it was just so great. It was great, also, to see the other people teaching there: Franco Gulli, Janos Starker…all these legendary guys who really taught music, and the ethics of music, in a very different way than we see these things taught today. Laurie: The ethics of music? Leonidas: The thing is, today, people are taught to become musicians in order to make a big career. But this was never the case, I felt, with people like Gingold or Starker. They just loved what they were doing. They loved the music, and they were happy and blessed to be part of that kind of work. Now, if one could also be successful and have a wonderful career, so much for the better, that's great. But this was not the aim. In other schools, I don't want to mention which ones, this kind of career (obsession) was part of their definition, it was in the blood veins, going all over the body and the brain and driving people crazy. Today we still have this. You see these younger and younger musicians who just cannot wait. They want to have these big careers, as if music is some kind of sport that, after you turn 30 years old, you cannot run any more. It's not like this, and the approach is wrong. Laurie: It was a very human approach at IU, I thought. Leonidas: Exactly. That's the most important thing that one could learn from these kind of personalities. They had experience, and they had lived through many decades at the top level of this job, yet still they were not going to make this kind of level 'The Priority' for somebody who was studying. In a Music School with a high level, the ambition throughout the school and the competition will be very obvious and very present. So then, how does one actually handle all this? How does one prioritize the right things for somebody, in order that they not become a desperate and sad personality after a certain amount of years, when things maybe did not work out the way they were dreaming? Then even if things work out in the best possible way, they still need to remain with their feet on Earth and be able to admire and feel the greatness of the arts -- not just the greatness of their skills. Leonidas: I do master classes. I don't teach regularly because I cannot do it seriously, I have to travel so much. For me, teaching is a sacred mission for anybody who can do it. Therefore I've started a little workshop that I do in Greece every year, which I hope to grow into something that would be a little Academy. It is every year, about three days, seven hours each day, quite intense. Last year, in fact, we had people from all over the world coming; we had an amazing amount of applications to take part in this. And then it was a wonderful level. Many people came from many parts of the world, even from Japan. I was not expecting that.. But I want to really create that…I think it's time to also inspire other people. And me it is important to project this kind of mentality, as I described before, that it is not all about career. Laurie: Does this mean you want to teach more? Leonidas: Eventually, at some point, yes. Conducting and teaching both demand interaction with many other people, and I'm fascinating by that. Laurie: You have been doing more and more conducting; what led you to the podium? Leonidas: First of all, the fact that the violin repertoire is rather limited, even though it is quite varied, and the orchestral repertoire is unlimited. Also, there's a certain kind of psychological mystery in the uniting of a conductor and an orchestra, in order to produce a fantastic result. I cannot really explain how it is possible that all these people breathe together, it's something that is magic, I find. As an instrumentalist, a soloist, you are always on your own. You obsess over your own playing, your own problems, your own worries and your own whatever. When one works with many other people, there is so much more to gain as a human being and as an artist. December 5, 2013 at 09:31 PM · oh darn. For a second there your typo got my hopes up. His newest recording is the Brahms Concerto, not Sonata.... but given that he's now playing the complete Brahms sonatas in recitals with Yuja Wang, I wish, wish, *WISH* they would record them.... any mention of that in talking with him? I am so glad attention is being directed to this wonderful player. I didn't listen to him much until recently someone mailed me and asked why he seemed to be ignored by many on this site. So I spent a lot of time listening to him and came to the conclusion that he is done of the most technically gifted violinists ever! not am comment I make lighly. But that is not to say he is a mere technician. On the contrary, he seems to me to be a very deep and creative musician. At times astonshing. The only reasons I could think of why he is not afforded ad great deal more adulation is he tends towards introspection rather than in your face, look at me, violin playing. Other than that he looks like an umeployed hippie half the time whichever doesn't bother me but probably limits his exposure in Playgirl. December 5, 2013 at 11:44 PM · Typo fixed! December 6, 2013 at 05:07 AM · I have quite a few of Kavakos recordings. I really enjoy the reportoire that he plays but for some reason I don't listen much to them. I have many times reflected on that fact and I believe that the reason is envy. As I am more of a teacher that had solist dreams, I like that I can find things that I would tell just about any living violinist that they should work on. But there are three violinist that just bugs me out and that secretly are my favorite violinists. Mullova, Hahn and Kavakos. Thank you for a wonderful interview! I love Kavakos! He is a rare combination of an amazingly superb violinist, an exquisite and thoughtful musician but also a very deep and spiritual person, all in equal fashion. Simply inspiring and I think this interview captures all of this, so many thanks! P.S. I have had the pleasure of hearing play the Brahms live a decade ago and it was an extraordinary experience. I really urge anyone who has the opportunity to hear him in concert to do so. December 6, 2013 at 01:56 PM · Yes!!!!! They will be recording the Brahms sonatas together. Very excited about that! December 7, 2013 at 05:58 PM · "You have to play in such a way that the people are in a great mood the whole time -- ready to dance and ready to celebrate -- so that the good spirit doesn't get lost somewhere." A great violinist and a good man. Thanks. December 9, 2013 at 07:08 PM · Christian C I was fortunate to see Mr Kavakos play the Brahms in London with Chailly and the Gewandhaus on his (Kavakos') birthday last October. Following Buri 's imagery, he rocked and so did the whole Barbican Centre! One of my most memorable concerts for a long time, I'd imagine. And Christina, at Verbier last summer, I was at the Wang-Kavakos recital performing the very same programme they are now touring with. It had all the promise of an excellent performance, once polished. But wonder how long they perform together before they reach the standard of the Kavakos-Pace partnership? December 9, 2013 at 07:09 PM · Great insightful interview Laurie! Thanks for sharing.